The gist: In this one, we’re talking about a few magical ways to help you manage email effectively and reach inbox zero on the reg. Obviously, we’ll go over a few of the best email apps for organizing your inbox. BUT HOLD UP. To really make a difference, you want to reduce how many emails land there in the first place! And that, my friend, is what part 2 is for. You all know I’m enthusiastically on the non-stop train to automation station. Automating processes and tasks is essential for me. As a solopreneur, it’s not like you have a full-time assistant or team…EVERYTHING is on you. And one of the places automating tasks is most useful? That frigging inbox that won’t stop bringing in new things. Inbox Zero is an elusive beast lots of us chase after. And if you achieve it, it only lasts a few minutes before a new email comes in and you’re decrowned. But while I used to spend an hour or two per day going through all my inboxes (omg that feels embarrassing now! ), I now spend that much time on it per week. While I’m a lot smarter with my email management habits in general, a big part of that huge decrease in time spent in my inbox is because of automation. 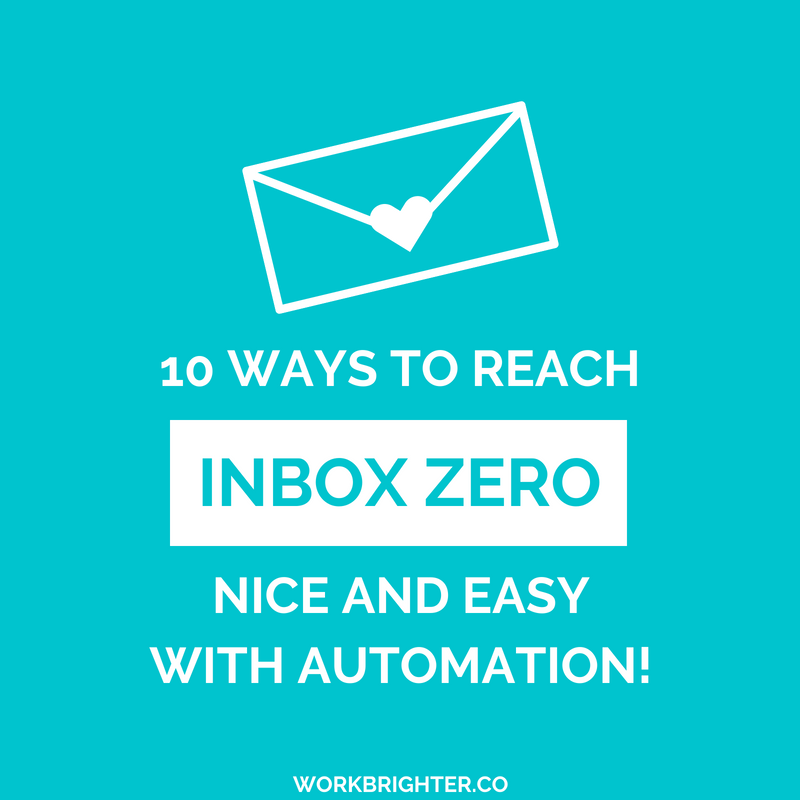 Talking about all the different ways you can make it easier to reach inbox zero would take a few hours. But here are the apps and features that can help you take care of the automation part. So that’s what we’re covering today! 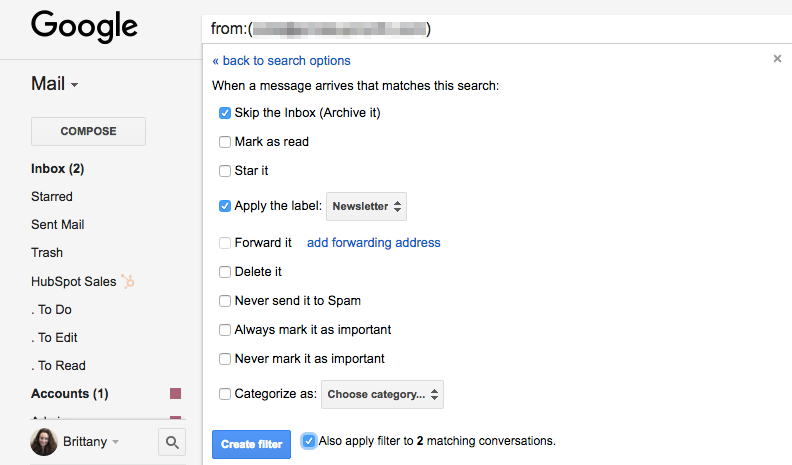 The automatic rules and filters built-in to Gmail and other email clients are pretty underutilized and pretty powerful. Way more powerful than you’d think. Between sending automatic responses, taking care of filtering and labeling, and getting rid of some emails completely, rules can handle most of your inbox triage and decluttering for you. That way, when you log into your Gmail, what’s right in front of your face is ONLY the important stuff. I’ve set up rules and filters recently with Gmail, Outlook and Apple Mail, and you can get really advanced with all of them. Even Outlook, which I hated otherwise, had pretty decent filters. Those are all the most basic email apps, and of course, in fancier apps you’ll have even fancier filters. Create a filter that adds a specified label to all newsletters and weekly content-based emails and lets them skip the inbox. This basically lets you create your own DIY Unroll.me, which I talk about more below! If you freelance or consult, create a rule that automatically stars all client emails (entering their company email domain as a search term – like @workbrighter.co – so they stand out for you). Create a rule that automatically labels and archives all notification emails from online business tools, marketing platforms, social media, and more. Add a rule based on subject line keywords to identify new client or sales prospects – reply to those emails ASAP. Use keyword rules to star or mark as important any emails that might contain a joint venture opportunity. Boomerang combines scheduling and automation in one awesome Gmail plugin. First of all, you can schedule emails for later. Sooo necessary for night owls like me. You can also “snooze” emails until later with one click, giving yourself an illusion of reaching inbox zero without all the work. Think of how many messages in your inbox are there to be referenced later. Your inbox (and life!) would be less cluttered if that guest post draft went out of sight and out of mind until the week you actually need to edit it. This is what snoozing email is for. To be honest, I’m not a huge fan of snoozing (I prefer the “only touch it once” approach to things), but have found really it really useful in certain situations. For example, after I come back from time off and have a crap ton of email, I’ll snooze a bunch of it so staring at my inbox is less overwhelming as I catch up on it all. You can set up automated reminders to follow up with people if you haven’t heard back in a certain amount of time. I’m horrible with following up, and I know I’m not the only one, so this helps me with all of my professional nagging. We should all use Boomerang more – I’d have so many more guest posts, joint webinars, and more by now lol. Those good email habits I mentioned earlier? Those are like 72% made possible by Unroll.me. The rest, I’m taking full credit for. It’s basically a support mechanism for newsletter addicts. Really, it’s more like a mass unsubscribe button and a newsletter digest. Those are the two big features. When you sign up for an account, you can view a list of all the senders of mass emails and newsletters in your inbox. Then you can one-click unsubscribe from any that are just taking up space. The second big feature of theirs is your rollup – and I’m not talking the fruity snacks from the 90s (which were delicious). You can choose which newsletters and mailing lists are included in a once-daily email digest instead of receiving them one at a time. They’ll automatically skip your inbox and go to a special folder, then be delivered in a rollup. 40 newsletter memberships and 1 new email per day, no matter how many lists send out something? Yaaasss. Templates, in general, are amazing. They’re just SO useful. Whether you’re sending marketing outreach or creating a new graphic, templates let you automate parts of whatever you can’t automate completely. There are a lot of fancy tools that let you create email templates – CRMs, outreach tools, customer service platforms, etc. And those tools are great. But I still mainly use the built-in Gmail Canned Responses. Canned Responses is a simple Gmail Labs add-on that lets you use templates in the regular web client without installing anything new. If you’re not using Gmail, most clients have a template or snippets feature, which probably includes the one you use. If not, even the free CRMs and outreach tools often have the feature as well. But if you prefer to keep things simple like me, you can keep in inside your inbox. Death to the generic contact form! Rah, rah, rah! But for real, only asking for a name, email, and message in one general form just creates more work for yourself. And for the person contacting you. For example, the Typeform on my business’s hire me page asks questions specific to the packages I create for clients. 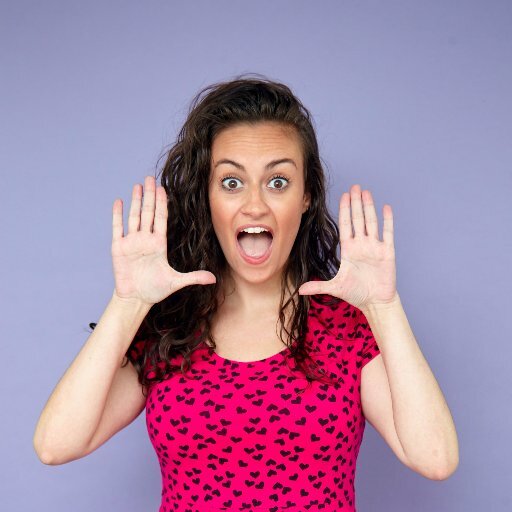 By streamlining that lead generation process, I’m able to get new client work off the ground faster and spend more time on that stuff instead of research. Once you’ve created fancy forms and email scripts, you need to put them to use. If you want to grow your email list and take advantage of email for real, for real, you need to upgrade to an email marketing provider. That way you can send your own newsletters and automated email sequences, and reduce how many individualized emails you need to send to customers and clients. While I personally use ConvertKit right now, I love that MailChimp’s easy enough for beginners but also has great intermediate/advanced features, and easy to integrate, automate, etc. It won’t work for all businesses, depending on your personal preferences, the types of emails you send, how you build your list, stuff like that. 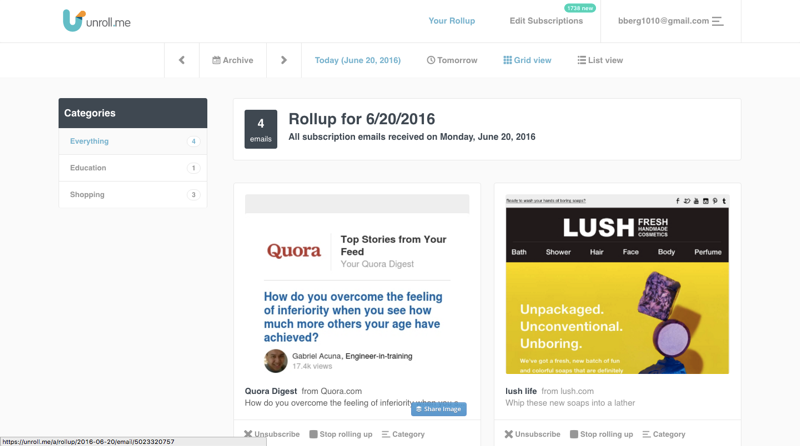 Now we’re getting into the tools that help you with your inbox by staying out of your inbox. First up’s your project management tool – Trello is my type A choice. I’ve used it for legit everything I can figure out a way to, from tracking recipes I both like and can cook without effing up, to client processes and assignments. One great way Trello and other project management tools come in handy is with email notifications. And push notifications, if you have their mobile or desktop app installed. Slack – oh my love for Slack, now let’s talk about waxing poetic… – is another awesome way to cut down on email both sent and received. For my clients that use Slack very heavily, I literally haven’t emailed with them since getting the job and getting added to their Slack team. You can also create a private Slack team for yourself to serve as a sort of personal dashboard with emails, notifications, and more from different bots and integrations. I like to call mine a personal productivity dashboard and self-care fairy. Automate and triage your inbox like a freaking superstar. IFTTT (“if this, then that”) lets you connect different apps and websites together to build your own automations, workflows, recipes, and integrations. Yeah, it’s ridiculously powerful. And all free. You can connect like 300 business apps to your inbox for different triggers and automations. And they even have an email parser to let you get really fancy. Well, that’s 10 tools that will keep you from going insane in the biz brain? Bet you never heard that unreleased Cypress Hill track. Which ones do you use to get to inbox zero? Leave additions in the comments. 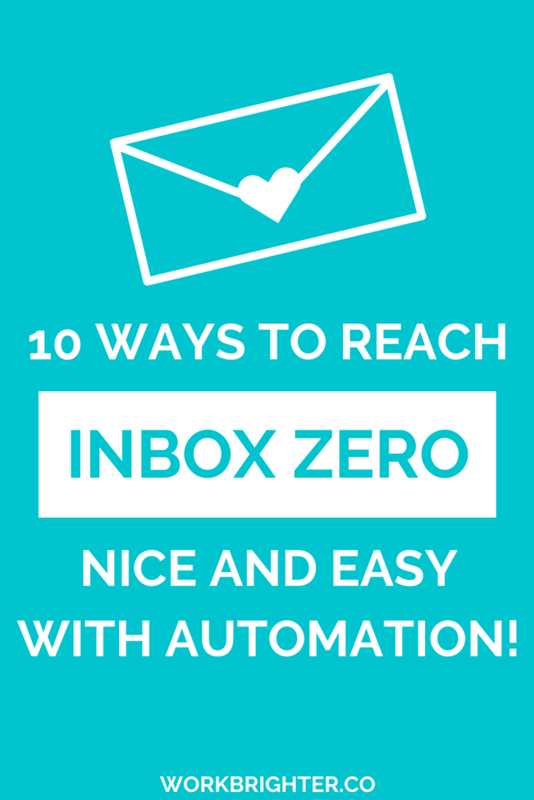 Enjoyed these inbox zero tips? Get more ideas like these in the Work Brighter Weekly. Note: This post was originally published on BrittanyBerger.com in June 2016.